Growing up in a broken home, I've always had trust issues. Unfortunately for my husband, he had always gotten the brunt of them even when they were undeserving. It's been something I've carried around all of my life. If you can relate, you've probably perfected my once set-in-stone mantra -"No one is trustworthy, but God. "That's what I had come to accept as truth – truth or not. I've always been good at withholding trust as a form of protecting myself . . . or at least I thought it was protecting me. But there did come a time when I realized that perhaps withholding trust was hurting much more than simply giving it freely. While the devil will always try to pour salt on our most vulnerable wounds, with God's help, we can find true peace with ourselves and our spouses by being willing to do the work and by taking a closer look at the truths in God's Word. When I first began to ask people to pray for my situation, I felt ashamed. Afterwards, however, I realized that it was just another way that God would use our pain for His glory. As things began to change, I started to see how it had allowed others to witness God's hand in our lives while also unlocking a power that I could not unlock alone. God did not promise us that love would be easy. There are going to be times when you are unhappy. There are going to be times when your spouse is unhappy. But, God says love is long suffering. This doesn't mean it is always going to be bad or miserable; however, it does mean that love is always going to be willing to suffer through whatever rain comes and patiently await the coming of the sun. In other words, love isn't when a wife receives roses, and then suspects her husband of wrongdoing as his motive behind the gesture. 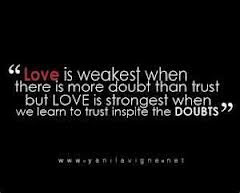 When words come out that are hurtful or out of character, love believes deep down they aren't meant at the core. Love believes that as our spouses go out into the world, we are on their mind and in their heart – and no one else. Words are a horrible trust buster. We can choose to use them to reflect our true feelings and uplift one another or we can speak out of anger and tear each other down. If your spouse is speaking out of anger, you don't have to join in. Speak life into your marriage; it will rub off on your spouse and vice versa. A smile is contagious! I remember playing with my cousin when we were little girls at Nanny's house. I vividly remember us finding this unusual pattern of "purple dots"that led to the front door step. They seemed to spell out a "Y"pattern, which we thought could only mean "yes"to the ever-wondering question of if she would really marry Jonathon Taylor Thomas someday. When you find yourself going back to childish thoughts with no merit, ask God for His wisdom and He will give it to you. If you can't let go of the memories that make trust difficult for you, remember what the Apostle Paul said, "Forgetting what is behind . . . I press toward . . . the prize for which God has called me." Forget past hurts. Speak with your pastor or get help from a Christian counselor. Remember that your past is not a reflection on your present. Our pasts can continue to harm us well, but only if we let it. I admit, I am still a work in progress, as is every wife and husband in God's universe. But daily, I know that I must seek Christ and believe in His truths above my own thoughts, trusting in His words and not my own emotions. As you face the trials that come into your marriage, as it is in a factory, as iron grinds against iron, remember that something beautiful happens to both pieces in the process. The Father polishes their rough edges; breaking them down and shining them up into what He wants them to be, which will soon be revealed if we only trust.